Glazing is the generic term for the transparent, or sometimes translucent, material in any exterior door system, patio door or skylight. Quite simply, it is the part that you can see through and that lets light pass through. The glazed component is usually a separately manufactured unit, which is sealed to prevent air, dirt and moisture from entering the air space. If the seal is broken, the only cure is to replace the sealed glazed unit. Glazing is characterized as being either single or double or triple glazed which is a reference to the number of panes of glass used. 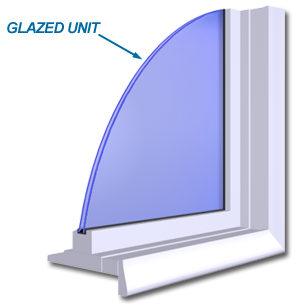 A single-glazed unit consists of just one pane of glass, double-glazed consists of two panes of glass separated by a single spacer, and triple-glazed is three layers of glass separated by two spacers. Sometimes, as a way to achieve the efficiency of triple glazing but to avoid the added weight of another full pane of glass, manufacturers will use a transparent plastic film instead of glass as the centre layer. All exterior door systems, patio doors and skylights in Canada should be at least double-glazed (with low-e and gas filled) to achieve the level of energy efficiency and performance required to be effective in our changing climate. For safety reasons, the only glazing material used in today’s patio doors is tempered glass. More and more exterior entrance doors are using tempered glass for safety concerns. It is extremely durable, possesses high structural strength and is very resistant to breakage. In the event it does break, it does so in a way that injuries can be avoided. Recent advances in technology have introduced laminated glazed units, which are made from high quality plastics, sealed between two layers of glass. The advantages of these laminates are that the glazed unit is much stronger to the point where it is virtually shatterproof.